To help promote the HR Profession and facilitate its earning of the highest level of business-value recognition it deserves. 4-Profit-HR does not deliver “task-level HR” to businesses. and educate their Management Teams on the profit-impacting value of having one. impact the Profit & Loss statement of a business. This is what CEOs want to hear from HR! 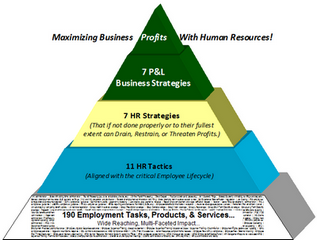 … from People to Employees to Human Resources to HR ROI to Profitability! Human Resource Professionals – whether consulting to businesses or employed within one - face a big challenge. Specifically, teaching and convincing the C-suite in a compelling manner, the Profit Impacting Value of HR. Often seen as “just the paper pushers and compliance police”, HR may not be held in the highest of regards by many in C-level management. And yet HR impacts every single aspect of a company, with small improvements offering dramatically increased profits, and small HR mistakes devastating the bottom line.